Activision Asks Itself: Isn't Call of Duty Like Guitar Hero Used to Be? A leaked Activision internal memo has CEO Eric Hirshberg asking employees: Isn't COD these days like Guitar Hero was a few years ago? It was three and a half years ago that the wildly popular Guitar Hero hit its popularity peak with Guitar Hero III. The music genre was king of the hill - EA's Rock Band was booming just as hard - and GH was Activision's superstar. That position has shifted, these days. Guitar Hero is on indefinite hiatus, and Activision's new star is the incredibly successful Call of Duty. But couldn't COD go the way of GH? That was the question posed by CEO Eric Hirshberg in an internal memo acquired by Giant Bomb. While the similarities are obvious, Hirshberg also says there are a few crucial differences between the two franchises that make COD a more sound investment. "[There] are several key differences between the two franchises worth considering," wrote Hirshberg. "Guitar Hero quickly reached incredible heights, but then began a steady decline. 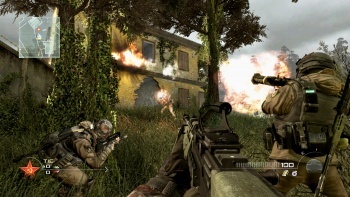 Call of Duty, on the other hand, has steadily grown every single year of its seven-year existence." He's not incorrect in that. Take COD4's 2 million copies sold in a month and compare it to Black Ops' 5.6 million in a day, if you want some proof. More to the point, however, Hirshberg says that the music genre popularized by Guitar Hero was experimental and while it had significant appeal, it never really weathered the test of time. The FPS, however, has been consistently popular since the days of Doom and Quake - and he thinks there will always be an audience for that sort of game. Furthermore, says Hirshberg, the audience is more engaged in COD than they ever were in Guitar Hero. With Guitar Hero, you'd break it out with a group of friends, but that was it - Call of Duty's thriving multiplayer community, however, means that gamers keep coming back week after week to shoot bad guys in the face. On all metrics, the memo reads, Call of Duty has never been more popular - sales, hours spent on multiplayer, DLC purchases - but Hirshberg admits that the franchise's "potential" won't be reached unless Activision works for it. In order to achieve this potential, we need to focus: on making games that constantly raise the quality bar; on staying ahead of the innovation curve; on surrounding the brand with a suite of services and an online community that makes our fans never want to leave. Entertainment franchises with staying power are rare. But Call of Duty shows all of the signs of being able to be one of them. It's up to us. Whatever you think of Activision as a moral entity, its leadership is fairly business-savvy. There's no question that COD is better suited to longevity than Guitar Hero (not the least of which because it doesn't require gamers to keep buying plastic instruments) but will yearly installments result in franchise fatigue? Maybe try a once-every-two-years thing, guys. Keep supporting the old games with DLC, sure, but space out the releases a bit. Just some advice.